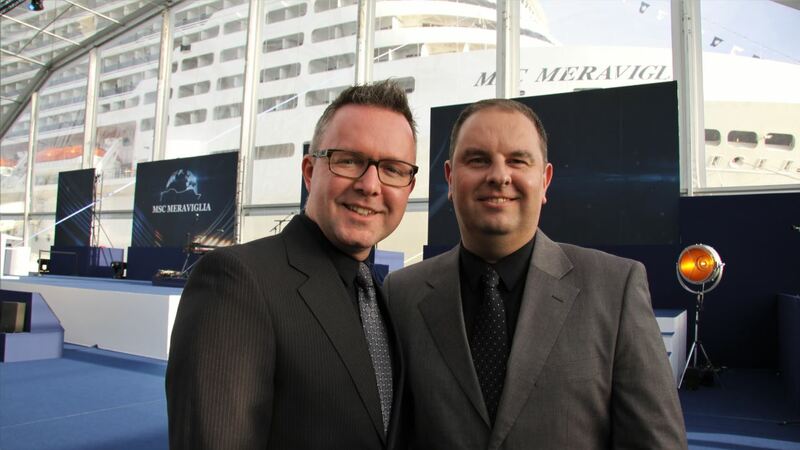 Prior to the official christening ceremony of MSC Meraviglia we were invited by MSC Cruises to enjoy two days onboard their new flagship and discover what sets MSC Cruises’ ship for all seasons apart from the others and makes it the eighth wonder of the world. 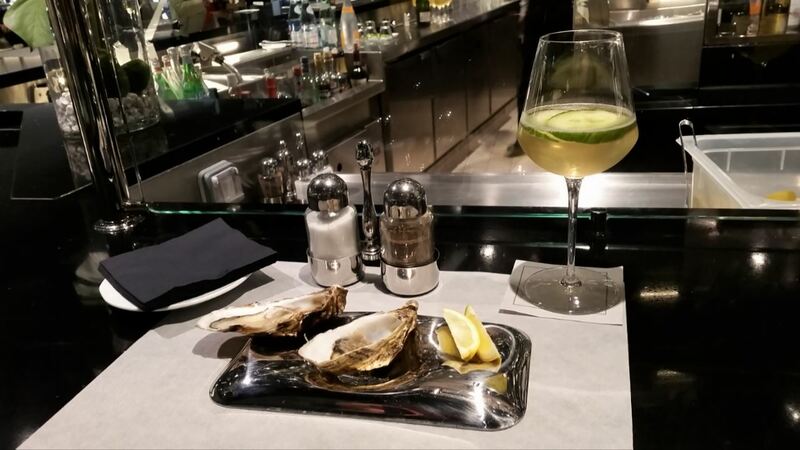 You can find out how we spent our first day onboard MSC Meraviglia by visiting Exploring a wonder: 2 days on board MSC Meraviglia (part 1). After just a few hours of sleep (having €1,000 of virtual money to play in the casino goes a long way) we started our second day exploring the rest of the 33,000 square metres of public space onboard MSC Meraviglia. 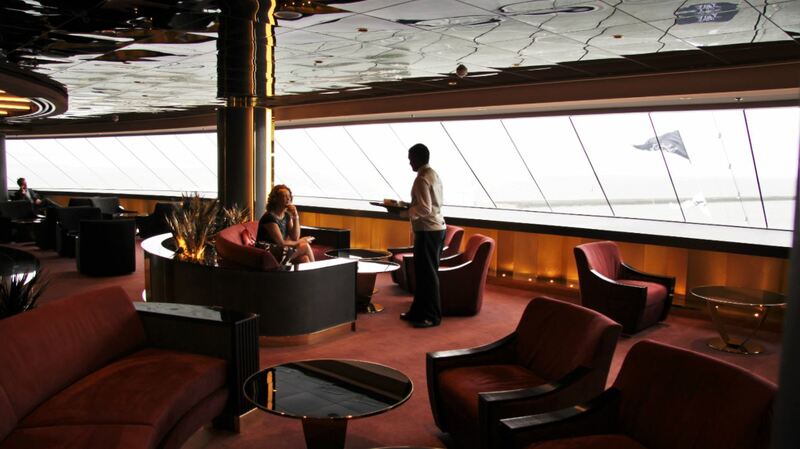 Located in the front of the ship the exclusive ship within a ship Yacht Club is spread out over three decks offering the best in luxury with its own concierge service, private lounge and restaurant and exclusive 500m² solarium, pool, grill and bar on the 19th deck of the ship. Walking around the exclusive area we were impressed by the extended Yacht Club but slightly surprised MSC decided not to include a glamorous Swarovski staircase. 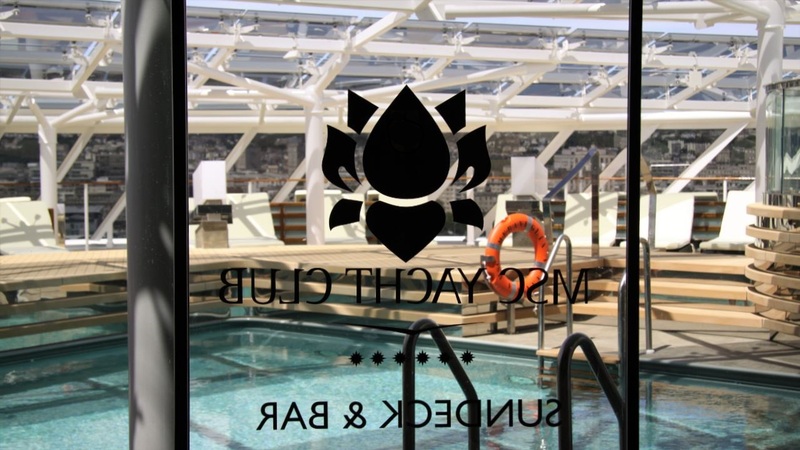 As we descended back into reality we wondered through the MSC Aurea Spa before heading outside to the main pooldeck onboard Meraviglia. 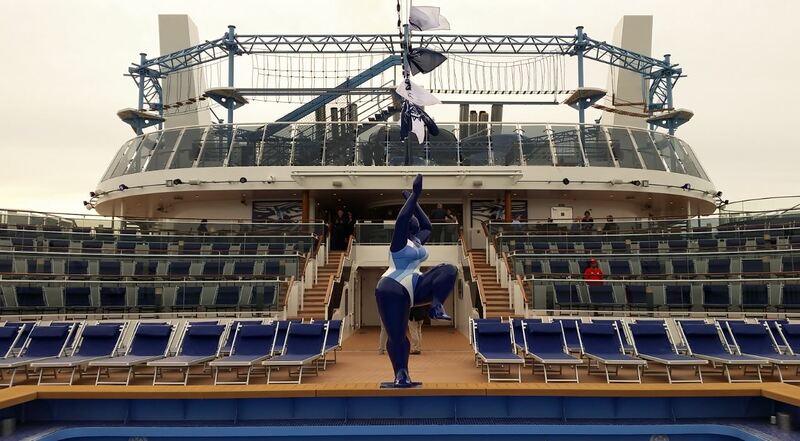 Part from four pools the ship also features nine, indoor and outdoor, whirlpool baths, an aquapark with three waterslides and the “Himalaya Bridge” rope course providing action and excitement 82 metre above sea level. 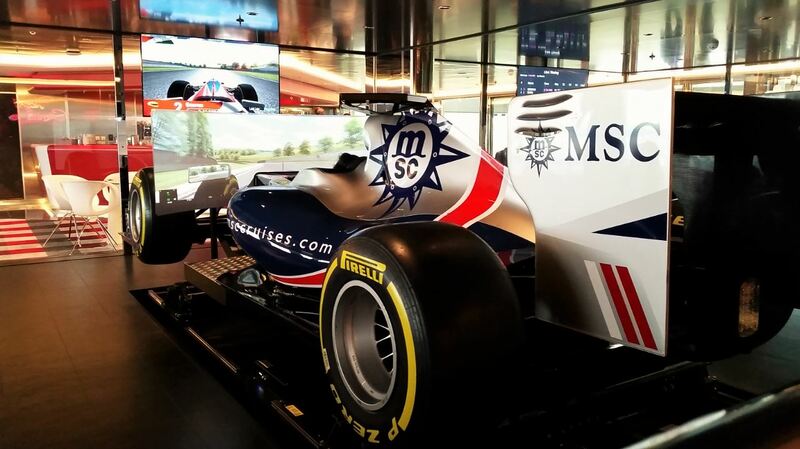 Inside, on deck 16, the activity continues with an indoor sportplex, two F1 simulators, a flight simulator, a 4D cinema and bowling alley. 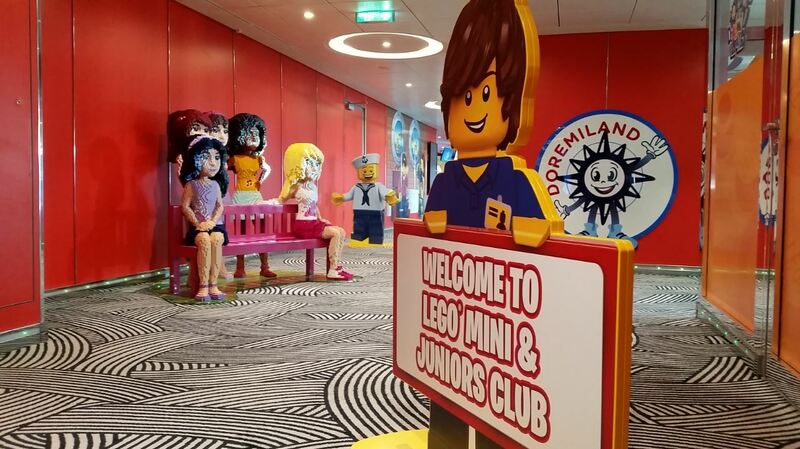 For the youngest cruisers MSC created a special Mini and Juniors Club in collaboration with baby experts CHICCO and LEGO. 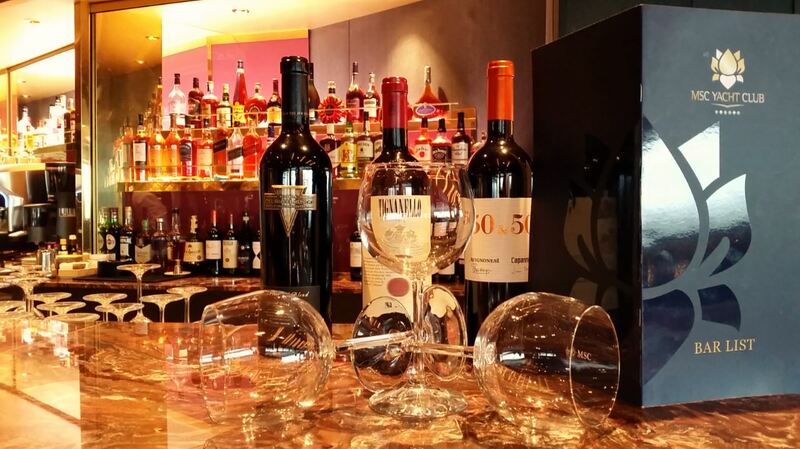 In order to make Meraviglia the perfect ship for families the cruise line has even designated a special family area in the Market Buffet Restaurant. Having explored most of the wonderful Meraviglia it was time to head up to the 985 seat Broadway Theatre for the International Press Conference. 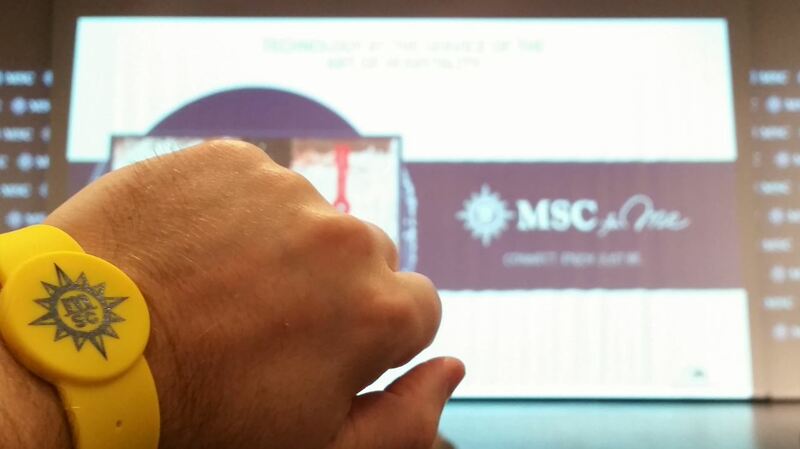 During the press conference MSC revealed some more details for their new World Class ships and other plans for the future. After the press meeting it was time for a quick bite at the Market Buffet (the Gala Dinner was scheduled for late after the christening ceremony) before joining the other guests in one of the 20 bars for the Gala Cocktail hour. It must have been 9p.m. when actor/comedian Gad Elmaleh kicked of the official Christening Ceremony by introducing Pierfrancesco Vago (MSC Cruises’ Executive Chairman), Laurent Castaing (CEO shipbuilder STX France) and Luc Lemonnier (Mayor of Le Havre) for their respective speeches. Joined on stage by a group of young children, Kids United, a French pop group made up of 8-16 year olds, touched everybody’s heart with their rendition of “Heal the World” and reminded us all of the importance of the rights of children around the world. 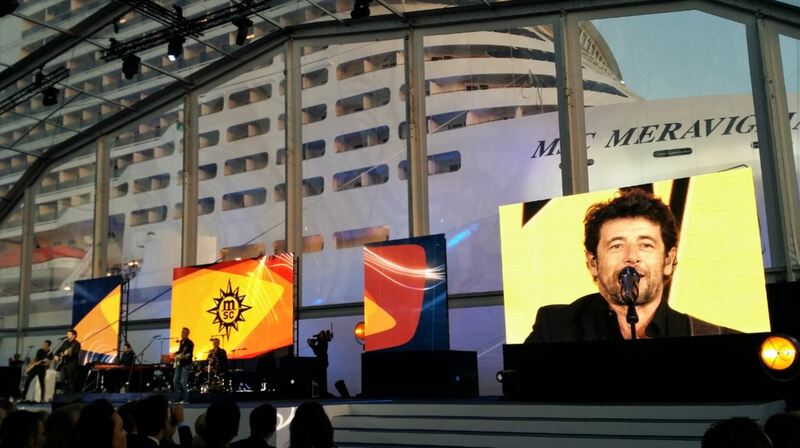 We’re not sure if the subsequent speech by MSC Cruises’ CEO Gianni Onorato was intended as an introduction for the group of ladies dancing the French Cancan or the mini-concert by Patrick Bruel but we definitely enjoyed the high level of entertainment and energy they provided. 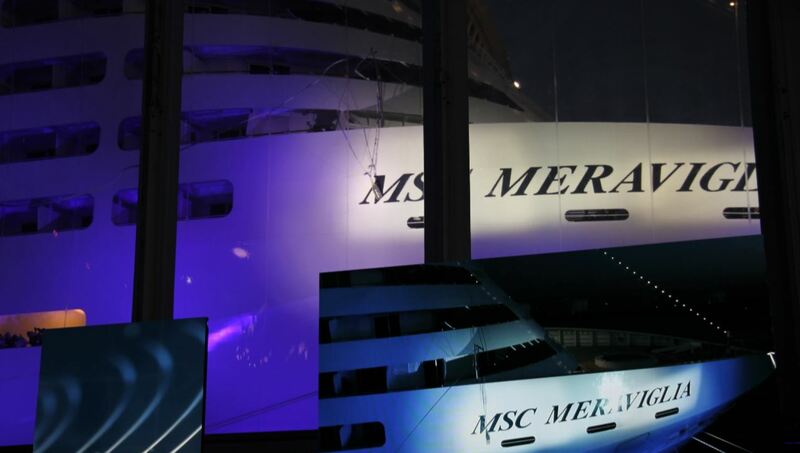 As night fell bright lights lit up Meraviglia and the ship’s officers, in meticulously white uniforms and in true “an officer and gentleman”-style formed a guard of honour for MSC’s godmother Sophia Loren. 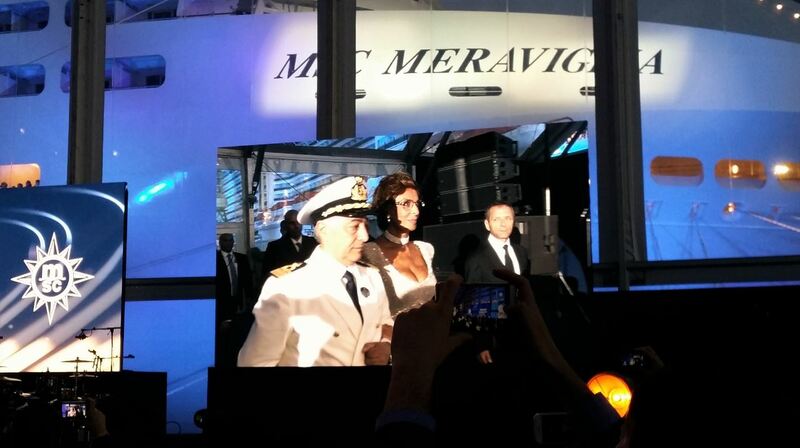 Escorted by the Master of the vessel, Captain Raffaele Pontecorvo, Ms. Loren stepped onto the stage to perform MSC Meraviglia’s christening. 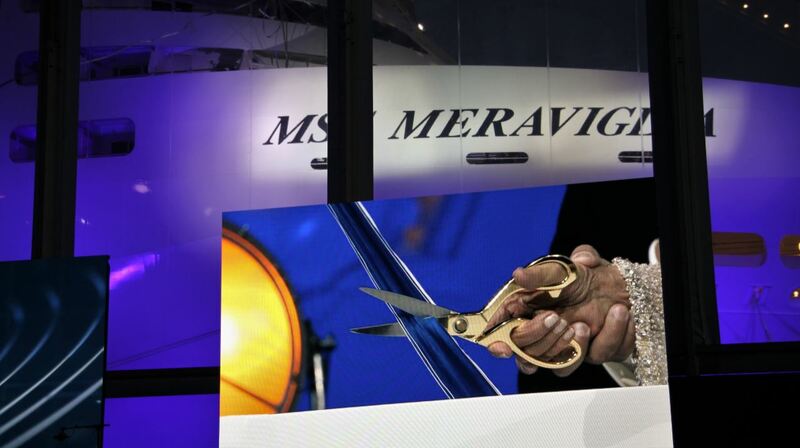 As Sophia Loren cut the ribbon an enormous bottle of champagne was released and smashed against the hull of MSC Meraviglia, officially christening the eighth wonder of the world. 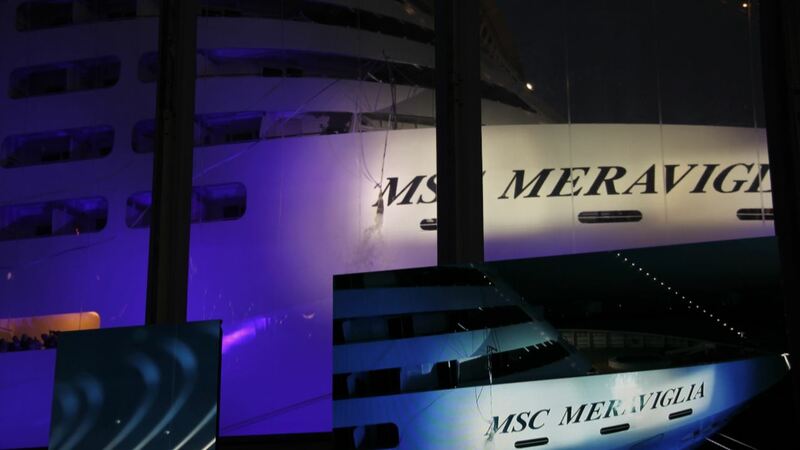 As MSC Cruises’ eighth wonder of the world was covered with champagne a rainfall of glittering confetti covered the crowd and the sky lit up with an amazing display of fireworks, bringing the official christening ceremony to a closure. 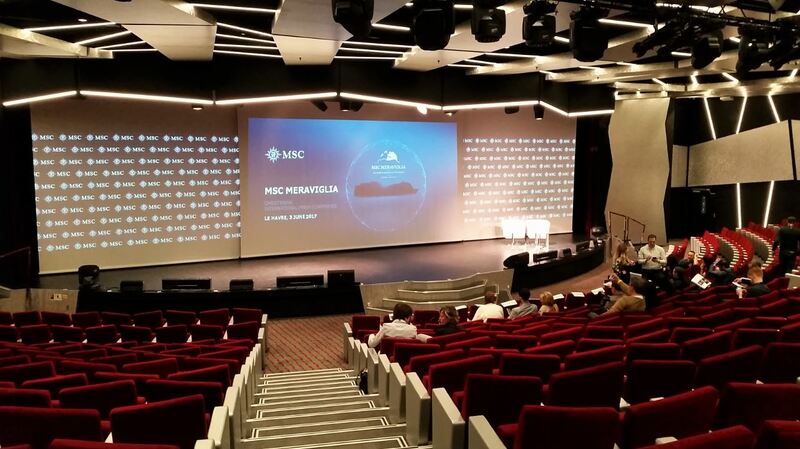 We would like to thank MSC Cruises for giving us the opportunity and honour to be among the very first guests to discover what makes MSC Meraviglia not only one of the biggest cruise ships in the world but also one of the best. 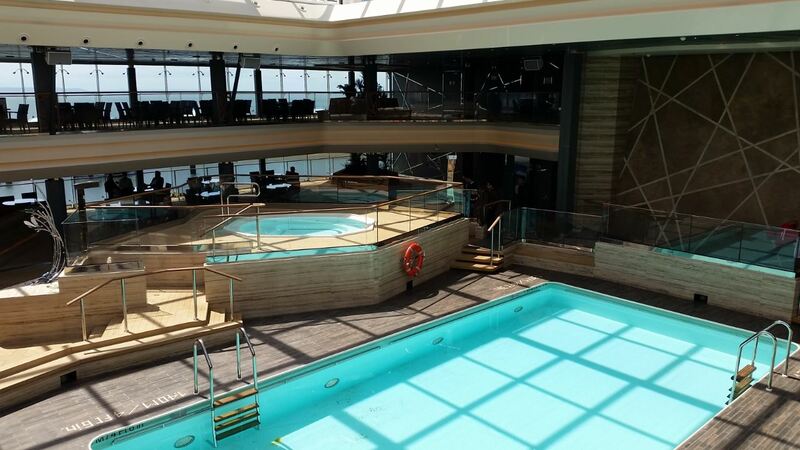 MSC has taken popular cruise ship features, like the Galleria Meraviglia promenade, lifted them to a whole new level and made us instantly fall in love with the ship. 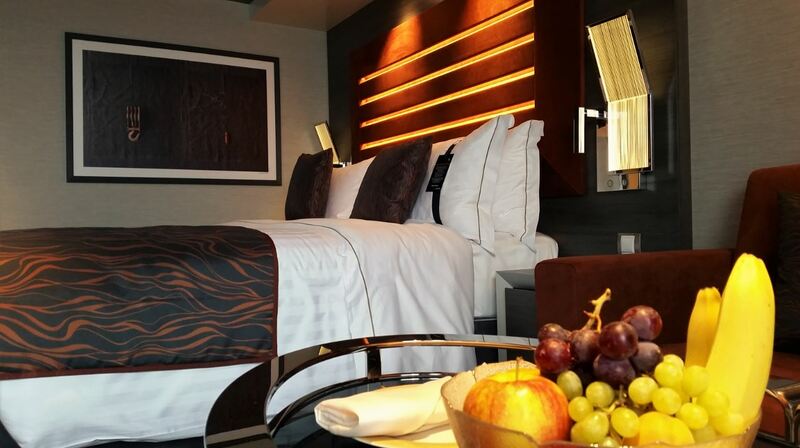 While two days onboard is not enough to fully enjoy everything there is to do (and there is a lot!) 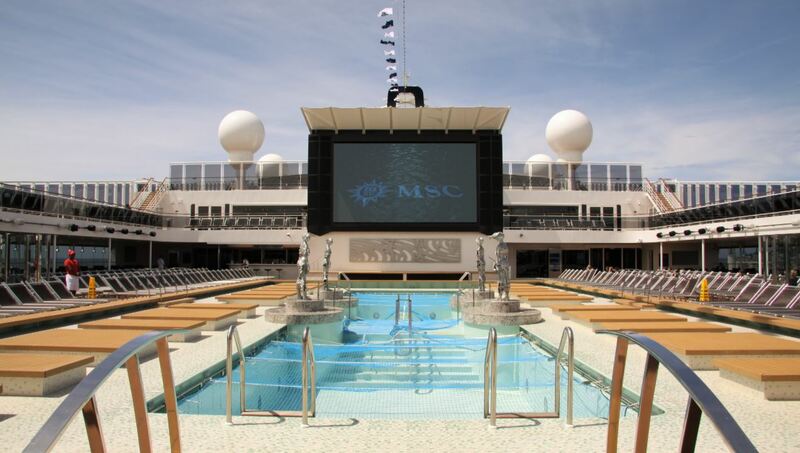 we believe MSC Cruises has succeeded in building a ship that not only sets a new standard for cruise ships as a destination in itself, but also as a ship for all seasons and most importantly a ship for all ages.